It was widely reported in the press that the first edition of 34,000 of these figures sold out in less than 72 hours when they were launched in February. The company urgently requested its factory to produce more of them such was the demand. 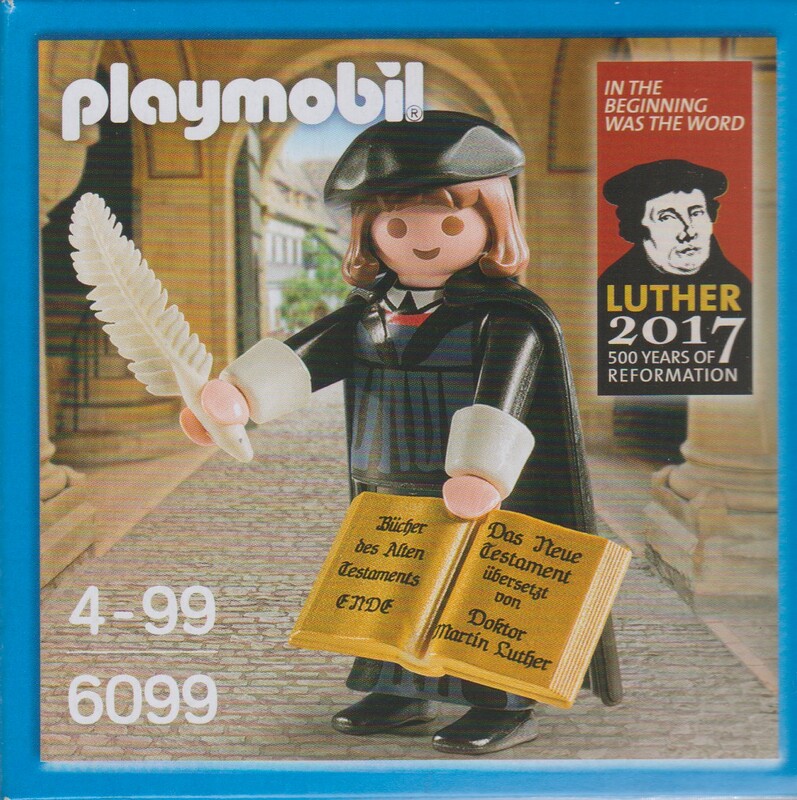 “The plastic toy, complete with a quill, German-language bible and cheery grin, was produced for the German and Nuremberg tourist boards and the Evangelical Lutheran Church in Bavaria, as Germany gears up to celebrate the 500th anniversary of the Protestant Reformation in 2017”. Quite probably this anniversary is the biggest event of all that could be connected with a reformation person or event. A few years ago (in 2009) the 500th anniversary of the birth of John Calvin was celebrated. There were no John Calvin toys so far as I know although one Presbyterian Church did have a free download of a John Calvin mask which was just about the scariest looking mask you could imagine. I was sufficiently impressed by the story of the sales of the Luther figure to track one down via eBay. 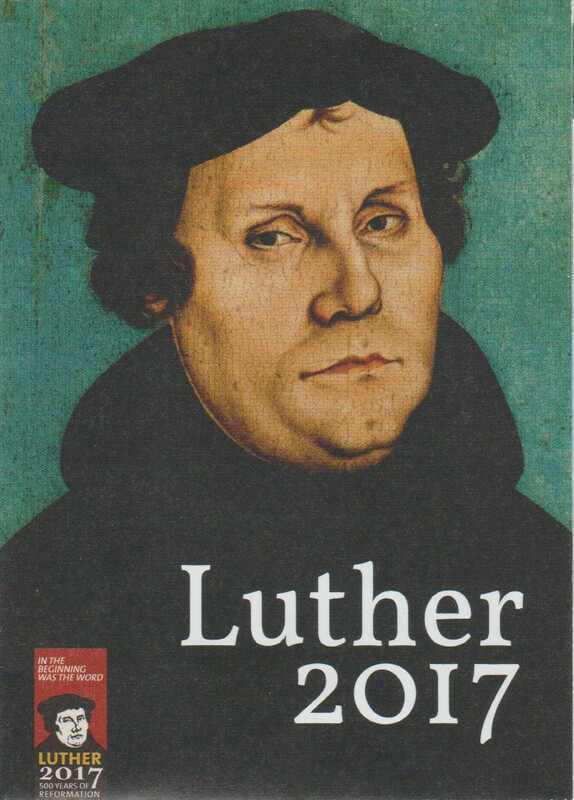 Martin Luther seems to be only on general sale in Germany although one imagines he would sell very well in the USA. It’s hard to imagine a similar figure being produced over here and one wonders what would be the equivalent? John Wycliffe? John Wesley? 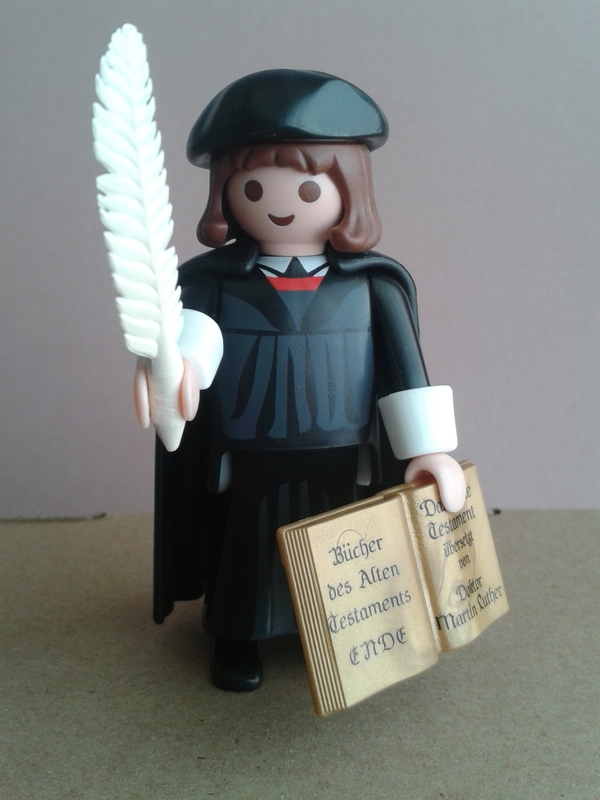 But the Luther figure is an attractive little model. It comes with its own Bible referencing his part in translating it into German and a quill pen. In addition you get a leaflet featuring his portrait and a map of places in Germany associated with Luther. I wouldn’t think there would be too much of a market for Martin Luther figures in the UK today. However, from the 1930s to the 1950s British toy companies such as Britains and Johillco both marketed lead models of clergymen. These weren’t named but were part of the wide range of civilian figures that were available in those days. To my knowledge there were at least four clergy figures on sale, black clad and generally hatted they must have sold in their thousands. The hardest to track down today is the Britain’s ‘thin vicar’ who ceased production just before the war. But it is good to see Martin Luther enjoying such vogue.